Two Games Into The Playoffs, The Stars Are Looking Like A Team That Could Make A Serious Run. Your Dallas Stars have secured two commanding home victories in the first round of the Stanley Cup Playoffs. Now, they look to tame the Wild up in Minnesota, with designs of continued stellar play. What will pose a bigger challenge for the Stars? The Wild getting the matchups they want while being the home team? Or the perpetual pothole problem on I-35 that could potentially incapacitate the Stars' official team bus? Good news is, the Stars are getting healthy at the right time, with Mattias Janmark, Jason Demers and Tyler Seguin all returning from injuries. Coach Lindy Ruff has the tough task of pulling players out of a lineup that came here to chew bubblegum. If you ask me, you dance with who brung ya, and let everyone heal one hundo. A side note: Some of y'all have been wondering about my credentials as a low-rent internet writer about the Dallas Stars. But guess what bruh? I been doing the damn thing since 1997. 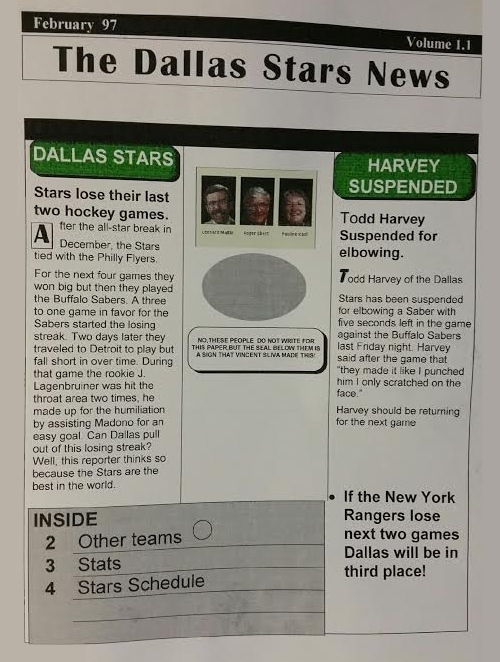 Yes, I started my first Stars newsletter way back in '97 with Microsoft PowerPoint, and yes, I did make up that Todd Harvey quote. Expect more throwback newsletters throughout the Stanley Cup playoff run. • Victory Green™ vs Minnesota Wild, 4-0. There's no better way to open the series than with a 4-0 blowout in front of a raucous fan base at the AAC — now with lazers! The Wild were only able to muster two shots on goal in the first period — an all-time franchise low — while Dallas tested goalie Devan Dubnyk 14 times. Dallas was able to burst Dubnyk's bubble in the second on a great overall play by the Roussel-Faksa-Hemsky “checking line,” in which sweet young Radek Faksa would score his first NHL playoff goal. Is the Stars third line better than the Wild's first line? This reporter thinks so. Jason Spezza also continued his hot streak, as his patented fake slapper wrister short side high (we'll need to work on a better phrase for that) made Dubnyk look really silly and probably hurt his feelings too. Spezza sure made it look easy, but it's nice to know that even us regular average people can still do some things better than Spezza. The Stars took a two-goal lead into the third period, and continued to apply pressure on the flailing Wild. 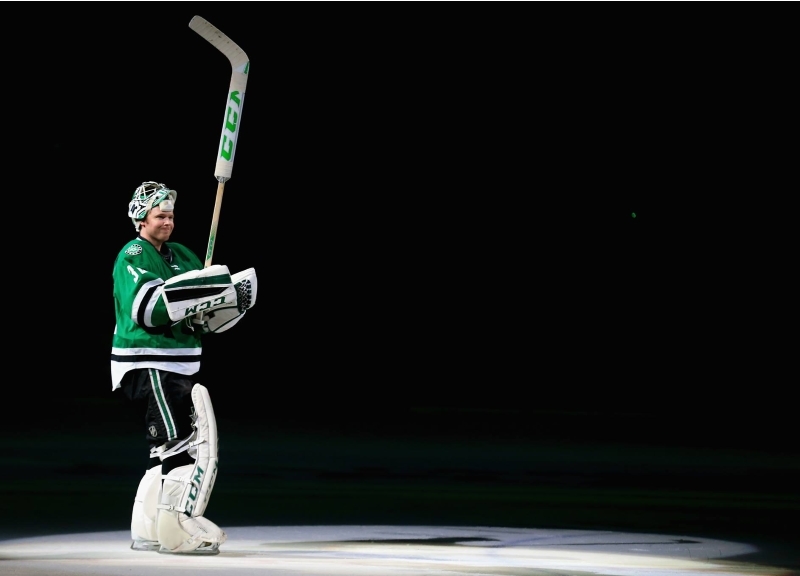 Later, the Stars capitalized on their sixth advantage of the night. Then, with a three-goal deficit, Minnesota opted to pull Dubynak for an extra “attacker,” only to have Jamie Benn score into the empty net, because, well, that's what we do. • Victory Green™ vs Minnesota Wild, 2-1. Welcome back, Mr. Seguin! After sitting out a month with a paper cut to his Achilles tendon, Tyler sure must have been itching to get back in the lineup. Sporting Kevlar socks to protect his Achilles heel — literally! — Tyler was used sparingly in an effort to get him up to speed without putting him in too much risk of re-injury. What a wonderful situation to be in. The Stars have won without the dynamic forward and, honestly, they don't need him to eliminate the Minnesota Wild. Having said that, the Wild looked like an actual hockey team in this contest. They put the puck on net, aggressively defended and, overall, put in a solid effort. Kudos to the Wild's penalty kill for keeping the lethal Stars PP 0-for-5 on the night. Kari Lehtonen was great, however, cleaning up defensive breakdowns with saves on the breakaway, and shutting down the Wild's attack in the waning seconds of the third to preserve the win. Benn and Antoine Roussel scored the only Stars goals for the night. One was marvelously skillful, and one was marvelously lucky. Guess who scored which! Roussel should be scratching lottery tickets after this, his first career NHL playoff goal off his skate, one of the craziest you'll ever see. Still, it's Benn who is already showing the makings of a Hart Trophy winner. Do the Jaime Benn — stop, pose for the frame. Join Dallas Stars' PA announcer @jeffkstars and beat dropper @tweetgrubes tonight at Gilley's Dallas for the official watching party at 7:30 p.m. and then on Wednesday at The Owner's Box for the decisive sweep. Give 'em both a kiss on the lips from me. Should the series inexplicably require a fifth game, the American Airlines Center will host that hypothetical contest on Friday. For posterity, let's just say the series goes to a sixth game. Well, that would be on Monday back in Prince's backyard. In the meantime, if you need a Dallas Stars tune to jam out to on your way to business calculus classes at UTA, Leht's got you covered there, too. Previous ArticleThings To Do On Monday, April 18.